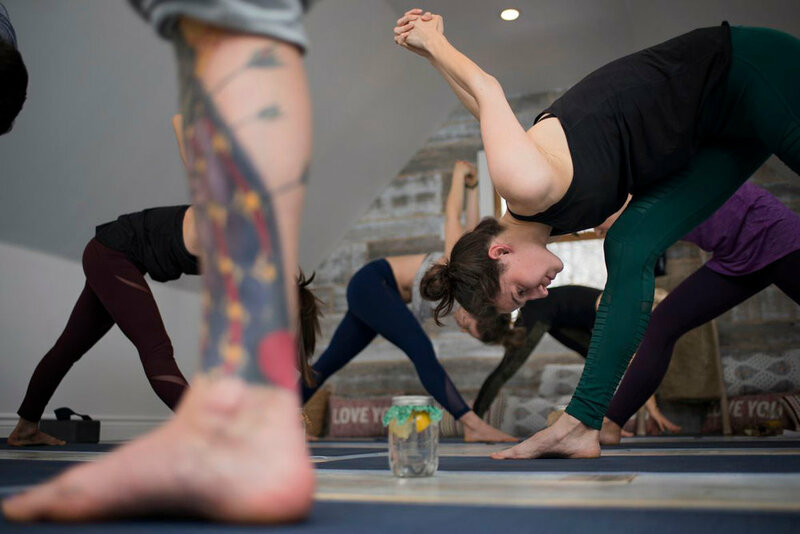 Join yogi Tina Lamontagne and me for the latest instalment of our seasonal yoga and wellness retreat at Yoga Attic in Greely. We'll start the day with an interactive wellness talk with insights on how to rejuvenate your body and optimize your health for spring. You'll be energized by a 75 minute yoga practice with Tina. Then dive into a hands-on cooking class with veggie sushi, miso soup and matcha nice-cream with me. Spend the afternoon in nature and dive into a meditative writing exercises all about creating space for the season. Finally, we'll close off the day with a restorative yoga practice. To register, CLICK HERE (you'll be redirected to the Yoga Attic webpage). Needing a break from city life to recharge your batteries? Let’s head into the great outdoors. Join Yoga Instructor/Outdoor Enthusiast Andrea Robertson and me for an evening of snowshoeing under the stars. We will meet at 5:30 pm in Gatineau Park, snowshoe for an hour to a cabin (3.5 km each way). I'll prepare a healthy vegan gluten free dinner and desert and give a wellness talk on optimizing your health. Andrea will lead the group into some feel good yoga poses using the props in the cabin with candlelit meditation and we will end the night in a silent meditation walk under the stars. What a way to close the week, enjoy the great outdoors, and kick off your weekend. Once you register, an email will be sent out to all a few days before event with finer details of where to meet and what to bring. Cost: $80 per person (price includes trail pass to Gatineau Park). Space is limited. To register, CLICK HERE (you'll be redirected to Andrea's webpage). There will be no refunds or credits given to this event but you may transfer your spot to a friend. Join Tina Lamontagne, and me for the latest instalment of our seasonal yoga & wellness retreats at Yoga Attic in Greely. We'll start the day with a warming winter drink and wellness talk. You'll participate in an awakening yoga practice with Tina before indulging in a colorful plant-based meal inspired by the season (prepared by me!). You'll unwind with a walk in nature and/or relaxing with a book or journalling by the fireplace. Then you'll participate in a hands-on healthy holiday cooking lesson featuring snacks and sips (aka healthier appetizers and mocktails). Finally, we'll close the day with a yin yoga practice and a meditation around an outdoor fire! For more information or to register, please visit the Yoga Attic website. In this interactive workshop, participants will learn all about lacto-fermentation. Working together, participants will make their own sauerkraut and kimchi and will also have the opportunity to try a few varieties as well. I will speak to the health benefits of fermented foods and share tips on how to include these foods in day to day life. Participants will walk away with a greater understanding of how to ferment, the health benefits of fermentation, and 4 jars of lacto-fermented cabbage (classic sauerkraut, German style sauerkraut, red ‘kraut, and kimchi). Please bring a cutting board and sharp knife, we'll supply the rest! CLICK HERE to register (you'll be redirected to Community Activities Group of Old Ottawa East website). Are you looking to learn more about plant-based health and wellness? Or curious about how to add more healthy foods to your diet? Join the inaugural Plant-Based Breakthrough Bookclub for a discussion about New York Times best selling book "How Not To Die" by Dr. Michael Greger. How Not To Die explores the foods scientifically proven to prevent and reverse disease and those linked to optimal wellness. This fascinating and light hearted read is direct to the point and provides actionable steps to help you become your healthiest self. Well-researched and well-organized, it explains some of the more common chronic diseases in the world including the natural remedies and changes in the diet that can remedy them. Starting at 10:30 a.m. join plant-based chef & nutritionist Amy Longard, along with other health & wellness enthusiasts, for coffee or tea and a guided discussion on the book, its take-aways, and lessons learned. Following the discussion you're invited to stick around for a healthy plant-based lunch. Our hosts, The Table, have kindly offered a 10% discount to bookclub attendees for their lunch buffet. This event is free and open to everyone, however we ask that you confirm your attendance on the Eventbrite page as space is limited. Register soon to avoid disappointment. CLICK HERE to grab your ticket. I'm so pleased to offer my first workshop in Halifax with Taylor Widrig of Mermaid Fare. At this interesting and informative workshop, you'll get an opportunity to taste a variety of seaweed-based dishes and take home the recipes too. The food prepared will be vegan and gluten free. We all know salads are nutritious, but they can be pretty darn tasty too! In this hands-on workshop, Chef & Nutritionist Amy Longard will help you prepare several deliciously different salads, including Buddha Bowls (medley of vegetables, grains, beans) in Tahini-Based Dressing; protein & fibre-rich Pasta Salad; classic Leafy Green Salad with Seasonal Veggies in Apple Cider Vinaigrette; and Kale Caesar Salad with Chickpea Croutons. All recipes are vegetarian, gluten-free and dairy-free. Seaweed is a veritable super food. More nutrient dense than any vegetation found on land, seaweed is an excellent food to incorporate into your diet. To learn about the health benefits and how to cook with seaweed, please join me for an interesting and informative workshop. You'll get an opportunity to taste a variety of dishes and take home the recipes too. The food prepared will be vegan and gluten free. Registration opens Tuesday, September 5. CLICK HERE to register (you'll be redirected to Community Activities Group of Old Ottawa East website). TORONTO friends! I'll be in town on August 18 and 19 presenting at the Canfitpro World Fitness Expo. For more info, please visit the Expo's website.